Mada launches a multifunctional tire-pressure gauge that has patented in Taiwan, Japan and China (photo courtesy of Mada). Since its inception in 1997 in New Taipei City, northern Taiwan, Mada Enterprise Co., Ltd., has been engaged in designing, developing and manufacturing high-quality tire pressure gauges, air chucks and related tire tools, with products marketed globally under its “MADA” brand. 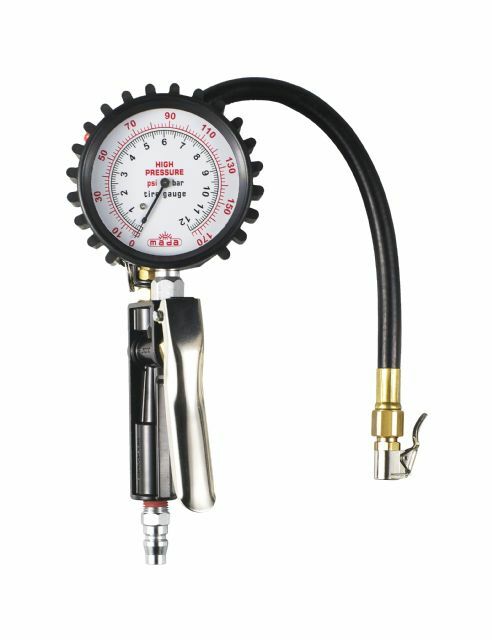 The company's product category encompasses varieties of tire pressure gauges, air nozzles, air chucks and grease guns, mainly for bicycles (air chucks work in France), motorcycles, vehicular equipment (especially passenger cars and engineering vehicles) and aircrafts, some patented in Taiwan, Japan and China. Committed to offering customers professional, high-quality and durable products, and building sustainable ties with customers, the company carries out rigorous quality controls throughout production process and pre-delivery inspections. On the payoff of the unremitting efforts, the company's products have been well received by buyers and end-users in over 40 different countries of the world. Drawing on its abundant experience and well-honed R&D capability, the firm has just launched a multifunctional (inflating, deflating, and pressure measuring) tire pressure gauge, which has been patented in Taiwan, Japan and China. The cylinder-type gauge features several outstanding advantages: the ability to withstand pressure up to 350 psi, a self-protection function, adjustable design, and replaceable parts. Further, it is available with replaceable, easy-to-change pump adaptors and air chucks in Schrader / Dunlop and Presta Valves, making it suitable for tires of all types of vehicles, equipment, and even aircraft.